Transparency Market Research delivers key insights on the Hygiene Breathable Films market in its published report, titled “Global Hygiene Breathable Films Market: Industry Analysis and Opportunity Assessment, 2018–2026”. 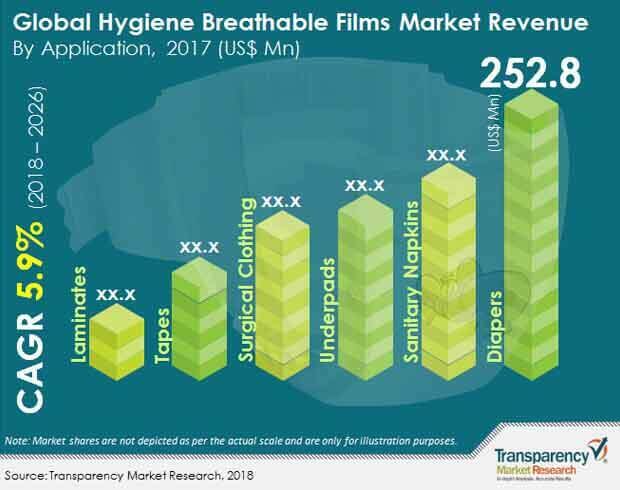 In terms of revenue, the global hygiene breathable films market is estimated to expand at a CAGR of 5.9% during the forecast period, owing to numerous factors, about which TMR offers thorough insights and forecasts in this report. Hygiene breathable films are flexible films used as back sheets for diapers, sanitary pads, under-pads, and other incontinence products. Hygiene breathable films refer to a layer of film on a surface of diaper or a sanitary pad, which are gas and water vapor permeable but are resistant towards any liquid. The polymers mainly used are Polyethylene, Polyurethane, and Polypropylene. Hygiene breathable films made from polymers form a three dimensional matrix constituting long chains of molecules. The semi-permeable membranes in hygiene breathable films form a matrix which is dense enough to let the water stay outside, but leave enough room for air or water vapor molecules to enter. Hygiene breathable films are manufactured using two technologies- cast extrusion and blown extrusion. According to TMR analysis, there are significant number of benefits associated with the production of hygiene breathable films using the blown film extrusion method. Since these hygiene breathable films have a lower weight per square meter, less raw material usage and desirable mechanical output is observed. There is a significant difference between diaper hygiene breathable films produced using cast film and blown film extrusion processes. While the former has a base weight of nearly 16 g/m², diaper hygiene breathable films produced by blow film extrusion have an inline stretch. These are also comparatively thinner with a basis weight of 12 g/m². According to an independent research, it is estimated that by 2050, more than 5% of the American population would be aged above 85 years, and will play a key role in driving the growth of the hygiene breathable films market. The adult diapers and underpads segment is expected to show a positive growth in the U.S due to the aging population. Hygiene breathable films include microporous and non-porous films. The microporous hygiene breathable films segment is expected to witness rapid growth as compared to the non-porous hygiene breathable films. Porous hygiene breathable films provide various advantages such as the minimization of anaerobiosis originating from the accumulation of CO2 in packaging and the automatic release of steam in a microwave system. Non-porous hygiene breathable films are among the alternative candidates for packaging applications and they can respond to desired and undesired temperature fluctuations by reversibly changing the gas permeability. According to TMR analysis, the introduction of biodegradable hygiene breathable films is expected to fuel the market for the global hygiene breathable films market. Diapers are disposed in huge numbers and end up in landfills, where they take hundreds of years to decompose. The introduction of biodegradable hygiene breathable films for diapers is expected to fuel the market for hygiene breathable films. Increase in the demand for diapers and incontinence products is expected to boost the hygiene breathable films market. The Asia-Pacific region will witness lucrative growth opportunities as the region is experiencing baby boom at present. The U.S and Germany are expected to dominate the hygiene breathable films market in terms of market share. With rising per capita income and growing awareness for health and hygiene, consumers are increasingly preferring premium diapers. The polyurethane-based hygiene breathable films segment is projected to witness the highest growth during the forecast period. Hygiene breathable films made of polyurethane have major uses in the medical sector. Hygiene breathable films are preferred for surgical gloves, surgical drapes, patient gowns, and table & bed covers as these are monolithic and create a better liquid barrier as compared to other microporous hygiene breathable films. Hygiene breathable films also have high mechanical properties such as, abrasion resistance, high durability, and low-temperature flexibility. High usage of micro porous hygiene breathable films in the medical industry, owing to its soft and absorbent properties is expected to drive the global hygiene breathable films market. Hygiene breathable films made from corn starch are expected to provide better decomposing options, thereby preventing harmful environmental impacts. These hygiene breathable films are prepared by blending an organic or inorganic incompatible filler with a polyolefin-based resin, which is then melted, film-formed, and stretched. Hygiene breathable films made from organic materials are an ideal choice for consumers as they provide better degradation options. The key motive is to have a global presence, either physical or through exports. The manufacturers of hygiene breathable films are likely to eye the lucrative regions of the Middle East & Africa and the Asia Pacific in the coming years. Mass urbanization in these countries, coupled with improved standards of living, is expected to be the key driving force behind the growth of the hygiene breathable films market. Key players considered in the report on hygiene breathable films include RKW Group, Trioplast Group, GCR Group, PT Asia Pacific Fortuna Sari, Fatra A.S, Schweitzer-Mauduit International, Inc., Kimberly-Clark Corporation, Nitto Denko Corporation, Skymark Packaging International and Sigma Plastics Group, Inc.